The Official Tiingo API has launched after months and months of people requesting this, followed by months and months of dev time. The reason it took so long? We didn’t just do standard-API stuff, but we built infrastructure in exchange data centers to help significantly reduce to costs to everyday users to financial technology firms and Institutional players. 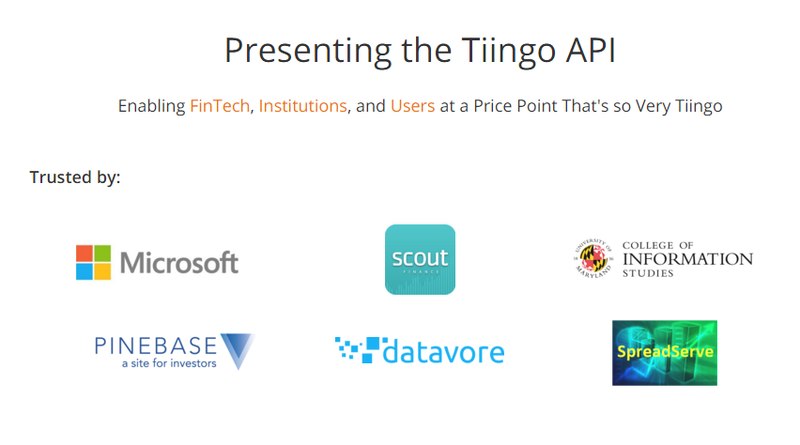 For example, EOD data is included in the Tiingo price, whereas for financial technology firms: real-time data is $500/month instead of $4200/month. Every user is entitled to 40GB of bandwidth a month. Yes we realize that’s insane – it’s why we did it. Do you have a historical price data request API example in C#? Yahoo stopped their ichart API last week which made me switch to the Tiingo EOD data. The JSON format is great and is better than Yahoo because the precision of the adjusted prices is much higher (many decimals). This is needed especially for stocks having had many splits because the older adjusted prices are then getting very small. Also, every column has an associated adjusted field so the corrections are explicit and easy to check for consistency. Big thanks.